Home Blogging tips How to make money from Amazon Affiliate? I was not good in getting income from selling products through affiliation. So I did not bother to focus much on it after blogging for 5 years. Signed up B&H Photo Video Pro Audio and Amazon Affiliate long time ago. But only got $20.63 from B&H Photo Video Pro Audio Affiliate and nothing from Amazon Affiliate. Most of my incomes are from advertisements like Google AdSense, Vibrant Media. And really envy with other sites that having high revenue from affiliation. Well, I know that the earning is not much (and I yet to receive the payment). But it is a good start for me. 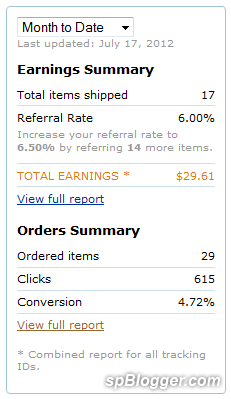 At least, I learned how to make money from selling products through affiliation. Banner ads without specific product do not help much. However, a product review article with link to the affiliate website really helps. Readers have more interest of purchasing that product after reading the review. So Conversion rate is much higher. Next article2 Google AdSense payments, mistake made by Google?